International Journal of Research in Health Sciences,2014,2,3,787-791. 1- Senior Lecturer. 2,3,4-Intern, 5-Senior Lecturer, Department of Pedodontics and preventive dentistry, Department of Public Health Dentistry, Ahmedabad Dental College and Hospital, Ahmedabad, Gujarat, INDIA. 6-Senior Lecturer, Department of Public Health Dentistry, Yerla Dental college, New Bombay, Maharastra, INDIA. Aim: To access the knowledge and practices of interns, graduates and post graduates of Ahmedabad Dental College and Hospital, Ahmedabad, Gujarat regarding radiographic protection. Materials and Method: The present cross sectional questionnaire study was conducted in Ahmedabad Dental College, to assess the knowledge and practices of interns, graduates and post-graduates regarding radiographic protection. 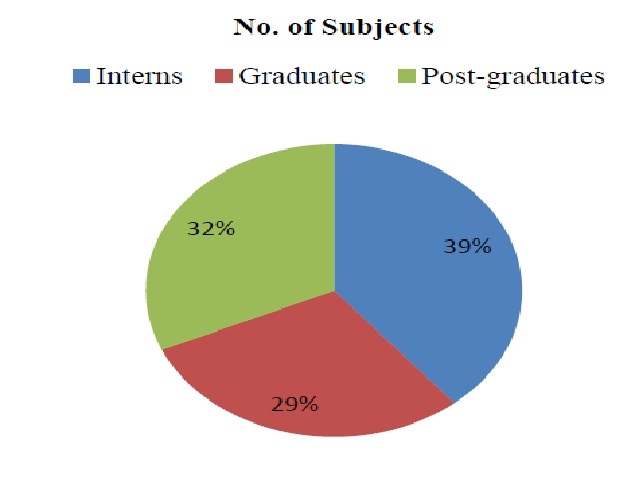 The study sample included 136 interns, graduates and postgraduates students. The survey was scheduled to spread over a period of 1 month. Data was collected by using self designed questionnaire (Annexure C). The questionnaire was developed in English. Questionnaire was administered by investigator himself to each participant on scheduled days and collected after two days. Collected data was coded, compiled and tabulated. The data was analysed by applying descriptive & inferential statistical analysis using SPSS package version 17. Result: Majority of the study subjects were aware of the side-effects of a radiograph on pregnant women and ALARA. On the contrary, almost half of the participants were not aware of NCRP/ICRP recommendations. Majority of the participants were not using lead apron while taking radiographs. Almost all the participants were aware of the symbol of radiation hazard. Most of the participants supported that they would use radiation protection protocols at the time of their private practice. Conclusion: The participants had unsatisfactory knowledge about the radiation protection protocols and radiation hazards.